Happy Thursday everyone! I hope those who were able to go to convention are having a GREAT time! Can’t wait to hear ALL the news! Since it is Thursday it is time for another Create with Connie and Mary Thursday Challenge. This week is a a fun color challenge based on the the cool Moonlight dsp Paper Stack! I just LOVE this paper stack and the colors are so awesome! I used this retro sketch for my card layout. Tie Hello Honey Stitched Satin ribbon around card top. Use Star Framelits to cut out Hello Honey and BlackBerry Bliss stars. Add Hello Honey one directly to the Whisper White and the Blackberry Bliss one using dimensionals. Create with Connie and Mary Summer Collection 2014 is almost over! If you are looking for ways to use all that ‘new stuff’ that you just got, this is for you! Just think…these ideas are good ALL CATALOG YEAR LONG! This collection features products from the NEW CATALOG…you don’t want to miss it! The projects are only seen by our subscribers and are not posted publicly in any gallery or online resource! More details on Create with Connie and Mary! 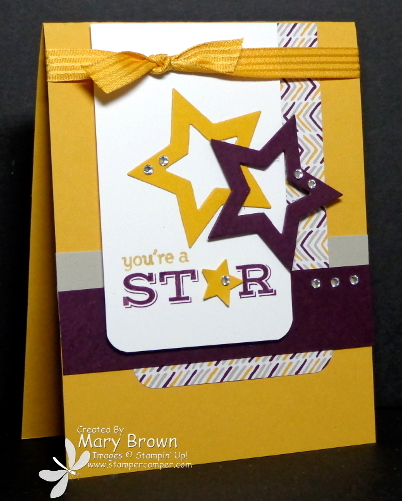 Don’t forget to head on over to Create with Connie and Mary and see the great cards by the Design Team. This entry was posted in Create with Connie and Mary and tagged Pictogram Punches. Bookmark the permalink. This is awesome! I love this layout and those stars are fabulous! Mary, I love this card! I love the stars and star framelits… and this sentiment from Pictogram Punches is just perfect with the stars! Great layout too! You are rocking’ the stars and the Pictogram stamp set! Love this! Great combination of stamps and framelits! And I love your placement of the rhinestones. They are so balanced! Another cute card, Mary! Love the pattern paper peeking out from the back – great design!